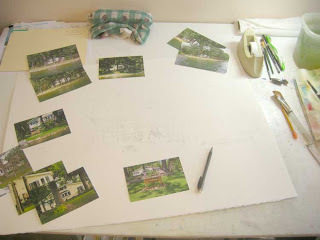 Recently I received a request to create a painting of a little cottage in Michigan. Since I have been experimenting with new techniques most of the summer, going back to my old method of painting holds a certain comfort for me. I am enjoying the tried and true techniques which have given me such nice results for so many years. I am using photos from the client as references. She took wonderful photos, which really helps in creating a painting of a place that I am unable to visit in person. She took views from several angles and lots of detail photos so that I understand what each of the garden objects look like. The photos were also taken in bright sunlight which shows the nice shadows and helps to define the depth and dimensions of the subject. Here I have lightly sketched the subject directly onto my watercolor paper. This should be a very fun piece to produce!